So many of us deal with it, especially since the lead-up to and aftermath of the 2016 election. So many of us in creative fields deal with it. And many of us you would never suspect (especially stoic Midwesterners). When I mentioned my anxiety to some good friends last year, they were shocked because they had no idea, but the more people I talk to, the more I realize that so many people I know have also dealt with it - this is not an exclusive club! Looking back, I’ve dealt with anxiety most of my life - I worried about lots of implausible stuff as a kid, got stomachaches on sleepovers, etc. I also think that I was somewhat depressed in college (gray, gray upstate NY winters didn’t help), and didn’t realize it at the time. For me, anxiety and depression are kind of 2 sides of the same problem, but I personally see the anxiety manifesting a lot more. In 2010, I experienced my worst bout of anxiety, during a stressful work situation involving the launch of untested software, while simultaneously flying around the country to audition for graduate programs in collaborative piano (3 trips in 1 month) - basically, having a quarter-life crisis. That anxiety really blindsided me because it was the first time things had gotten that bad. On the outside, it looked like I was functioning, but things were pretty bad - I almost always felt like I was going to puke and ate little more than bananas many days, while waiting to hear back from schools. At the time, I wasn’t taking care of myself well. I ate whatever sugary snacks showed up in the office, didn’t sleep enough, and rarely exercised. I made some changes, and with the help of a great therapist (there’s zero shame in therapy, and I think that everyone should get to go), I was able to recognize that all of my negative thoughts were not automatically true - what a game changer! It took almost a year, but I finally started to feel better, then my dad had a stroke and was in the hospital for the better part of the summer (he’s much better now), so naturally the anxiety fired up again. After my dad got home and things stabilized, I learned to manage the anxiety pretty well (the most important thing for me is not missing more than one day of exercise in a row), but it’s really sneaky and can creep up without you even realizing it! I started to question whether I should really be teaching so much - I had originally thought that I would feel like I had “made it” when I had a studio of 30 students, but it turns out that for an introvert, that’s just a recipe for burnout, especially when you add in teaching 3 group classes of 5-7 year olds, extra gigs, blogging, and trying to compose daily. I thought that my lighter summer teaching schedule would allow me some space to rest and the anxiety would subside, but it didn’t - it kept getting worse, even as I tried a huge list of tactics: I was already exercising daily, eating almost no refined sugar, drinking almost no caffeine, getting acupuncture regularly and a massage monthly, and meditating occasionally, and then I also tried CBD oil, meditation daily, changed my diet (started eating meat again after 14 years without, and low carbs), examined if any foods or yeast were causing inflammation in my body, went back to therapy, used positive affirmations, essential oils, tried EFT (tapping), epsom salt baths for added magnesium, reducing stimuli (no podcasts or music on in the background, wearing sunglasses), Rescue Remedy, tulsi tinctures, kava stress relief tea, and probably more things that I’m forgetting. So, I’d tried literally everything I could think of, short of medication, and nothing seemed to be making enough of a dent in the anxiety. I was very resistant to the idea of trying meds, partly because I hoped I could control it on my own, and partly because I typically take a more holistic approach to my health as much as possible, but I was so miserable that I finally considered it. In August I started taking Celexa, which gave me horrible insomnia on alternating days for 2 weeks and made me into a total zombie. I was cautiously optimistic that things were getting better at that point, when I left for California to visit family and go to California Brazil Camp, but flying and leaving my normal surroundings gave me a lot of anxiety. Halfway through the week at camp, after 3 weeks on meds, I suddenly didn’t feel anxious all the time (being off the grid from phones/wifi certainly didn’t hurt), and it finally felt like there was leftover space in my head. I am very grateful that the first medication I tried was the right one - not everyone has that experience, and it’s so difficult to wait for weeks while one’s body adjusts, not knowing if it will work. How did the anxiety get better? The Celexa definitely gave my brain a boost (bonus: I now have really vivid dreams that I usually remember in detail), and the lifestyle changes I’d started over the summer began to help, but I think that the main reason I feel better is that I started a personal spiritual practice, which I didn’t realize was missing from my life. My daily walk is essential - I use it to focus on a mantra or my breathing, or use it to gently untangle my brain if something is upsetting, asking myself what I need (and hopefully actually giving myself that). Doing self-compassion meditation has also been huge - we can be so hard on ourselves about performing well in all aspects of our lives, while also doing way too many things at once. We often don’t think twice about pushing ourselves to keep working, but would probably hate a taskmaster boss that did that to us! Notice that I said “get better”, not “cure my anxiety” - I have no illusions that being on medication cures the problem, and I know that this is a lifelong issue that I will always be prone to. If my life gets more stressful and/or I don’t keep up my healthy habits, I definitely feel it, and it’s a learning process of awareness that I have to commit to. I’m certainly not perfect, and I’m still prone to workaholic tendencies, as much as I try not to fall into that trap (that Midwestern farmer heritage dies hard, as does the stereotypical musician lifestyle). Lisa Congdon talks about her experience with workaholism and anxiety here, and I totally relate to all of her takeaways. I felt my anxiety ramping up again this week, as I’m nearing spring break (starting after my concert tonight!) and have gotten a bit fried from a busy month, but I am MUCH more sensitive to the red flags of increased anxiety and impending burnout now (feeling crabby/unable to handle work/stressful situations as well as normal, heart racing, feeling fearful for no good reason, feeling exhausted rather than energized after a walk, etc.) So, I won’t let things get as bad as they did last year if I can help it. Most of us don’t get a whole lot of emotional training in our upbringing, so going to a therapist or counselor is SO helpful for gaining these tools. They can also guide you as to whether medication is a good choice for you. And, of course, if you’re thinking about hurting yourself or others, call for help immediately: the National Suicide Prevention Hotline is 1-800-273-8255. 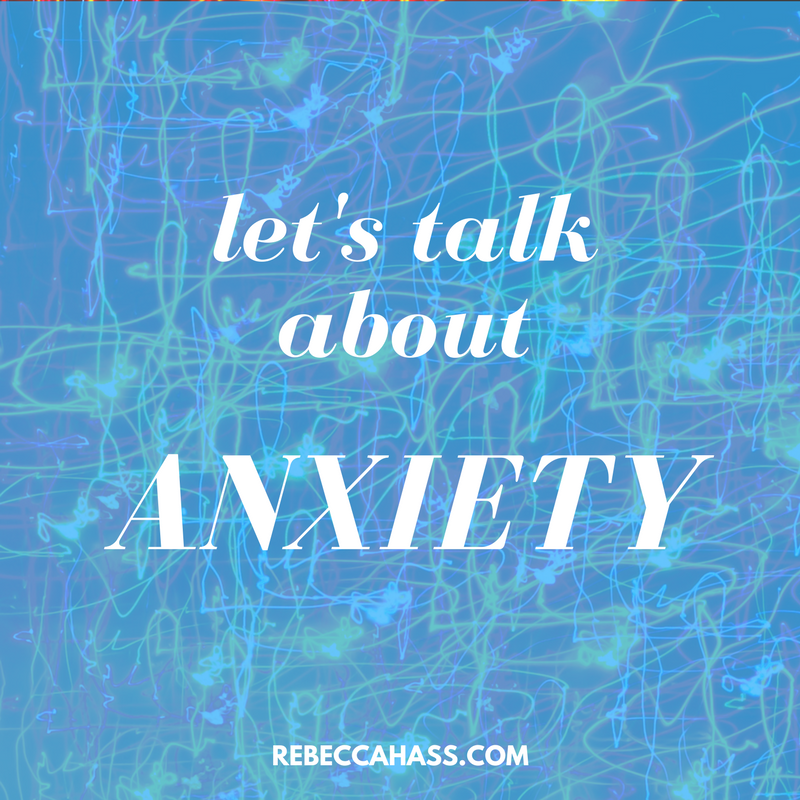 Sometimes as anxiety is creeping up, we don’t even realize that something is bothering us, especially when we’re too busy to process all of our daily experiences. When the triggers are happening, speak kindly to yourself, as if you were taking care of a child (this takes practice). Find ways to ground yourself, like deep breathing, or petting a furry friend. If you feel overstimulated easily, try reducing stimuli with sunglasses, earplugs, avoiding screens, or whatever you need to do. I also feel really comforted by having weight on me via heavy pillows, blankets, or cat sitting on my chest. Have a few friends or family members who either know what it’s like to struggle with mental health, who you can call or text when you’re feeling panicky. Here’s how you know that someone doesn’t understand anxiety - they ask you, “What are you so anxious about? You should just chill out.” To which I reply, that’s kind of the definition of anxiety: it often happens for no good reason - anxious brains aren’t reacting properly to normal stimuli. It can feel so alienating when you feel like you’re going crazy and no one understands. Even a daily 20-minute walk makes endorphins that anxious brains like! Or, try a dance break? Of course, working through exhaustion is often unavoidable, but I know that continuing to push through without enough of a chance to rest will lead to burnout and increased anxiety, so I have to be really careful (and even schedule rest days/parts of days on my calendar). Doing a brain dump can help get these swirling feelings out of your head, but I also know that it’s hard to think clearly when you’re in a state of anxiety. Going back to read it later might be helpful, or maybe just the act of writing will make you feel a little better. Cutting out sugar and caffeine are both immensely useful in managing anxiety, and maybe low blood sugar is exacerbating it, too. I highly recommend getting assistance with this process - Lucia Hawley of Essential Omnivore helped me SO much (and you can work with her online, wherever you may be!) Her recent blog post about anxiety + food (the first in a series) also has some really good considerations. This has been a hard one for me to come around to, but dealing with mental health challenges has forced me to be so much more self-aware and to take care of myself better. Also, the sensitivity that makes me susceptible to anxiety is actually a superpower that makes me a good musician and accompanist. As many times as I’ve cursed my brain for its difficulties, making friends with it is much more helpful. And, I wish it wasn't this way, but giving birth to the next, upleveled version of yourself usually comes after a period of struggle. I know, to overworked musicians, this one sounds hard, if not impossible, but you must! If you don’t have enough space in your schedule, you won’t have time to process all that’s going on in your life (which I’m betting is a lot!) I think that people with anxiety need even more time to process, as do sensitive people. Also, it takes a lot of energy to support others through teaching and performing, and we don’t give ourselves enough credit or leeway for that. I mean this literally and mentally/emotionally - I’m sure that you’re doing a great job at so many things and pushing yourself pretty hard, so you deserve that little break for an extra cup of tea, a walk outside, or just to say kind words to yourself. There are a million tips for managing mental health, but we’re all individuals, so ultimately it comes down to experimenting until you know what works for you personally (which can be frustrating, but necessary). * Please note, this post is not medical advice, just a means of support. Seek qualified medical advice if you need it! If you struggle with anxiety or other mental health issues, I'm holding space for you - you’re not alone. I sincerely wish you the best in managing it, and hope that any of this post can be of help to you. What are your best tips for managing anxiety? Let me know in the comments!